You might have heard, but here on the East Coast we’ve been getting a little bit of snow this winter. And by a little bit, I mean a LOT. The snow has been relentless with record breaking amounts of the white stuff falling out of the sky. In fact, as I type it’s snowing again! We don’t live in an area that normally sees a lot of snow, so I’ve been spending a lot of time trapped in the house, unable to go to work, go shopping, or do anything but shovel the driveway over and over again. What’s a girl to do when she’s trapped in the house the week before Valentine’s Day with a carton of heavy cream threatening to expire and a few ounces of high quality chocolate? I’ve never attempted to make my own truffles before, but I certainly have eaten my fair share of them. Unfortunately for my waistline, it turns out that truffle making is a ridiculously easy, albeit messy, affair. A few basic ingredients and some chilling time combine to make the most intensely chocolate and silky smooth truffles you can imagine. This time I made Bailey’s Irish Cream and coconut truffles with what I had in the house (see: snowed in), but I can’t wait to make these truffles again to try all sorts of new flavors! The recipe below is for making both Bailey’s Irish Cream and coconut truffles at the same time. If you want to make only one flavor, double the appropriate liquor and add it to the whole batch, omitting the other liquor. The powdered sugar coating for the Bailey’s truffles doesn’t hold up in the fridge, so coat them just before serving. I used 60% Callebaut semi-sweet chocolate and 70% Sharffen Berger bittersweet chocolate. Combine chopped chocolates in a medium bowl. Set aside. In a saucepan over medium heat, bring heavy cream, butter and sugar to a simmer, stirring to dissolve sugar. Pour hot cream mixture over chocolate. Stir gently until melted and smooth. Divide chocolate mixture evenly between two small bowls. For Bailey’s Irish Cream Truffles: Stir 1 Tablespoon of Bailey’s Irish Cream into one small bowl. For Coconut Truffles: Stir 1 Tablespoon of coconut rum into the other small bowl. Label the bowls (so you’ll know which is which! ), cover tightly with plastic wrap and refrigerate for 4 hours. Once chilled, working with one bowl (flavor) at a time, scoop out about 1/2 teaspoon of the chocolate mixture and quickly roll into a ball with your hands. Repeat with remaining chocolate mixture. 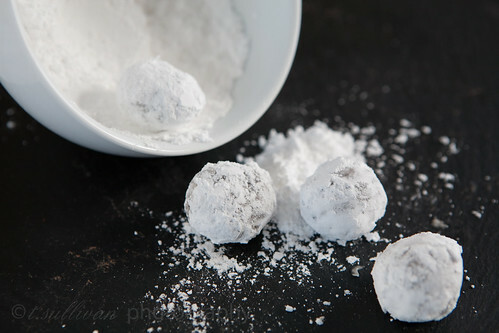 For Bailey’s Irish Cream Truffles: Roll truffle balls in powdered sugar to coat. 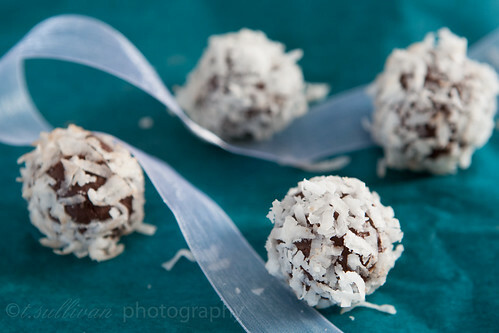 For Coconut Truffles: Roll truffle balls in chopped coconut to coat. Store truffles in an air tight container in the refrigerator for up to one week (as if they’ll last that long). Yum. I love making truffles and they are so easy! Dangerous, indeed. What lovely truffles!!! I have a bunch of chocolate and cream in my kitchen. I should finally make truffles. Yours look great! Oh those truffles look so good! I’d love to try to roll truffles in coconut. Those look SO good! I’ll be right over! Oh wait, no I won’t (see: snowed in). coconut rum. coconut. irish cream. chocolate. all in all, these must be the best truffles ever.